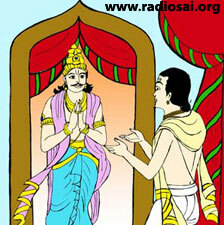 Prahlada was not only a devotee of Lord Narayana but also a very righteous king. He was also the most bountiful of kings. He would never say 'no' to anyone who approached him for a favour, gift or help. Once Lord Indra intended to test Prahlada and so came to him in the guise of a Brahmin. Prahlada offered his respects to him and asked, "What do you seek of me? How can I make you happy? The Brahmin replied, "Oh king! I want you to gift me your sheela (character). Prahlada said, "So be it. Your wish is fulfilled. I am gifting away my sheela to you." The Brahmin left the court. No sooner did the Brahmin leave, than a charming young man was seen walking away from the royal court. Prahlada questioned him: "Sir! Who are you?” The young man replied, "I am fame. I cannot stay with you any longer since character has left you." 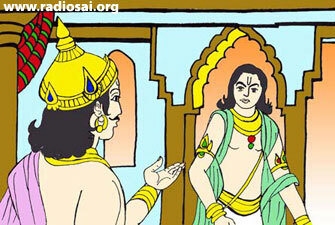 Prahlada permitted him to leave. A few seconds later, yet another handsome person was seen walking away from the court. Prahlada asked, "May I know who you are?" He replied, “I am valor. How can I be with you without character and fame? Therefore, I am leaving." Prahlada permitted him to leave. Next another lady was seen moving away with tears in her eyes. Prahlada ran towards her and asked, "Mother, who are you?" She said, "Son! I am Dharma Devatha (righteousness). I don't have a place where there is no character, fame and valor. Even Rajalakshmi has left you." Prahlada fell at her feet and said, "Mother, I can live without character, fame, valor and Rajyalakshmi, but I cannot live without you. How can I send you anywhere? It is the duty of the king to protect righteousness; that alone is the basis of the entire world. Please stay with me. Do not forsake me!" The Dharma Devatha agreed to stay. And when this happened, all the others too returned to the court and said, "We cannot exist without Dharma Devatha. Let us please be with you." Lord Indra tested Prahlada only to illustrate to the world the greatness of Prahlada, who practiced the principles of righteousness steadfastly.